Uncover a refuge dressed in white on the open plain. In the centre of the Alentejo and in a vast valley in Arraiolos, the lines of an ancient 16th century monastery were drawn and have now been transformed into the Pousada Convento de Arraiolos - Historic Hotel. At this historical pousada the whiteness and austere architecture, characteristic of these buildings, have been perfectly combined with attractive and simple contemporary design, creating a lovely and cosy feel in all its spaces. We suggest putting the diet on hold so that you may delight in the typical cuisine of the Alentejo found on the restaurant’s menu. These extra calories can easily be burned off later with a few laps in the swimming pool overlooking the valley. A well earned rest can be taken on the sunny terrace, in the shade of the monastery’s cloisters or in the tranquillity of your room. Be sure to visit the nearby traditional village of Arraiolos with its houses dressed in blue and white, to climb to the castle that watches over it and to feel the rugs that have become its claim to worldwide fame. You may also wish to venture slightly further out and arrive in Évora, Estremoz or Vila Viçosa, a few of the places in the Alentejo that shouldn’t be missed. As an alternative to a day of culture, a more active day can be planned with a tennis match, canoeing, attempting to hunt partridge or exploring the plains of the Alentejo. Borba, Estremoz, Évora, Redondo, Vila Viçosa. Take the A2 highway to the Algarve, then turn onto the A6 towards Évora. On the A6, head towards Montemor/Arraiolos. 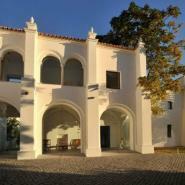 Upon leaving the highway, drive for nearly 18 km towards Arraiolos, and then follow the directions to the Pousada. "Excellent Hotel! Wonderful surroundings, rooms, restaurant. Definitely recommend this Pousada. Staff exceeded our expectations and was really friendly." "The breakfast was a lovely continental spread with cheeses fruit pastries, champagne, etc. During the afternoon it's literally like tea at the Ritz in London... The pool and all the surrounded area were lovely." "The crowning feature of the hotel was the terrace deck with panoramic views of the valley and towards the fortified walls of the old castle. Other features of note included the lush gardens with colorful flowers and fields. The service offered at this hotel was good, with helpful and friendly staff."